You probably will never see a play like this again in your life. In the 10th inning, Dustin Ackley led off with a double and moved to third on a Miguel Olivo ground out. To put the double play in order, the Fish decided to intentionally walk Carlos Peguero. On the third ball, Steve Cishek threw it way wide of the cather on what is the easiest throw that a pitcher has. As the ball went all the way to the backstop, Ackley came running home and scored. It was a close play which could have resulted in an out but Cishek misplayed the throw back from the catcher John Buck. I was so excited to first look at Gameday on my phone and see that it was the top of the first and we already had a hit. Ichiro led off the game with a single. I didn't have to watch 6 innings go by as we were no hit. When I checked again, both teams had three hits in the fourth. I hate working while the game is on. As I look back and see that Ackley was on third base with only one out and didn't come across to score, I'm glad I didn't watch. I would have been more than irritated. The fifth inning was when we got our first run. It was almost comical, as Doug Fister finally got tired of getting no run support and decided to take it upon himself. He hit a double into center field and was the first run to come across as Ichiro and Brendan Ryan had back to back singles. Another night that the pitchers are getting things done. The Marlins tied the game in the bottom of the eighth inning on a double by Omar Infante. 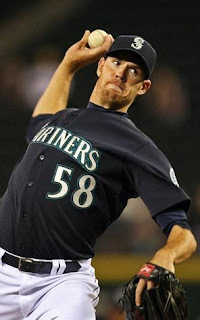 After the inning Doug Fister came out of the game for a pinch hitter and the M's failed to score leaving Fister with a no decision once again. Even after giving a run of support to himself, nobody else could seem to make it happen. I know he will say he's happy that the team got the "W", but really, who wouldn't be furious about the constant letdown of their teams offensive production. Ackley finished the night going 3 for 5 giving himself a season average of .300 to date. He is the first player that I have heard come to the M's with a scouting report of being able to drive the ball into the gaps and it actually be true. Ackley had a single, double and a triple tonight. Ichiro had two hits and Ryan had two hits. The remainder of our lineup went a combined 1 for 24. That one hit, the double by Fister. The Texas Rangers, Anaheim Angels and the Oakland A's all lost today, which means that the Mariners reclaim second place from the Angels and climb within a game and a half of the Rangers again. As the race for the West gets closer and closer, we look ahead to a 3 game series with the Atlanta Braves as the Rangers will face the Astros. The M's will be at home and be the home team tomorrow. Let's hope for another series win this week and finally surpass these Rangers for first place.